We are starting the Blogging Marathon 24th Edition today. It was in 2011 January that I first started this Blogging Marathon. The first edition was a month long one, then we went on to do a 14 day edition, finally settling down to a three day marathon all four weeks. BM has got me many friends and we enjoy and enrich our online experience. Coming to this week, I am starting with a theme to do “Gravies from three different states”. 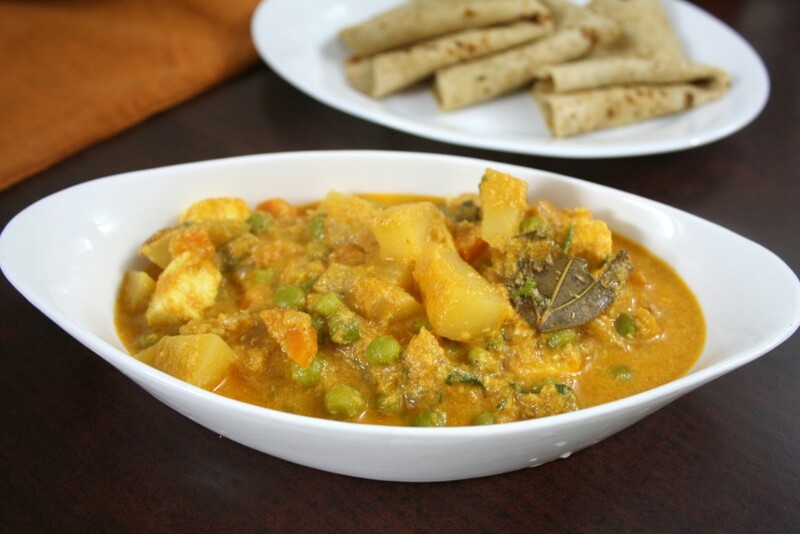 For the first day, it’s a lip smacking mixed vegetable korma, that’s so famous in Tamil Nadu. This is normally served with Parotta, sometimes with Chapatis and Pooris as well. I already have couple of other versions of Kurma in both Cooking 4 all Seasons and over here as well. The recipe today varies with the way the gravy is made rich with the usage of cashews and coconut. I am actually fond of this delightful Korma from Tamil Nadu. We also have something very similar in Andhra. Infact we no longer can differentiate the difference in the recipes! If you want to know the many Kurmas that I have already, just click away! Cube the paneer, roast them and keep it aside. In a pressure cooker, heat oil add all the whole garam masala, saute for couple of minutes. Then add the finely chopped onions, saute till they turn colour. Then add the ginger garlic paste. Followed by the cubed vegetables. Saute on high flame, then simmer and add tomato puree, turmeric powder, red chili powder, coriander powder and salt. Cover with lid to get the cooking done faster. Once you see the tomato colour changing, add the ground coconut paste and cashew paste. Saute well and mix everything together. Cook for 5 mins, till the masala gets cooked properly and change colour. Then add enough water to get the consistency you want and cover with lid and cook for a whistle or two. Once the pressure falls, remove the lid and bring to boil. Add the roasted paneer, and chopped coriander leaves. Simmer after it starts boiling for couple of mins. A classic dish.. The entire house will be filed with its fragrance & aroma when it is prepared..
Wow posting the recipe on the dot!!!! and this kurma looks so inviting!!! kurma looks great dear…feeling hungry!! Kurma is one of my favourites too….I love to make kothu parotta with leftover kurma. hi sis.first time here.yummy kurma.all time fav.happy to follow you.wil u support me?eager to joining the marathon. Kurma looks awesome Valli. Good to go with anything. 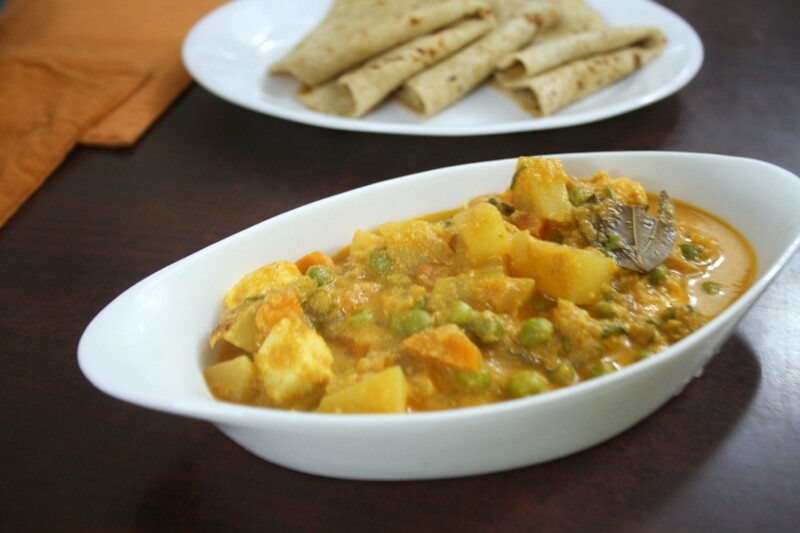 looks so nice and creamy – and with paneer must be so good – pinning on to my to try list! No matter what the variations are kurmas are an eternal favorite :).Looks very tempting Srivalli.. Such a classic dish.. Looks yumm! !